For children with stage II testicular malignant germ cell tumors (MGCT), the survival is good with surgery and adjuvant chemotherapy. However, there is limited data on surgical results for cases in which there was no imaging or pathologic evidence of residual tumor, but in which serum tumor markers either increased or failed to normalize after an appropriate period of half-life time post-surgery. To determine the use of chemotherapy for children with stage II germ cell tumors, we analyzed the outcomes (relapse rate and overall survival) of patients who were treated at the Sun Yat-sen University Cancer Center between January 1990 and May 2013. Twenty-four pediatric patients with a median age of 20 months (range, 4 months to 17 years) were enrolled in this study. In 20 cases (83.3%), the tumors had yolk sac histology. For definitive treatment, 21 patients underwent surgery alone, and 3 patients received surgery and adjuvant chemotherapy. No relapse was observed in the 3 patients who received adjuvant chemotherapy, whereas relapse occurred in 16 of the 21 patients (76.2%) treated with surgery alone. There were a total of 2 deaths. Treatment was stopped for 1 patient, who died 3 months later due to the tumor. The other patient achieved complete response after salvage treatment, but developed lung and pelvic metastases 7 months later and died of the tumor after stopping treatment. 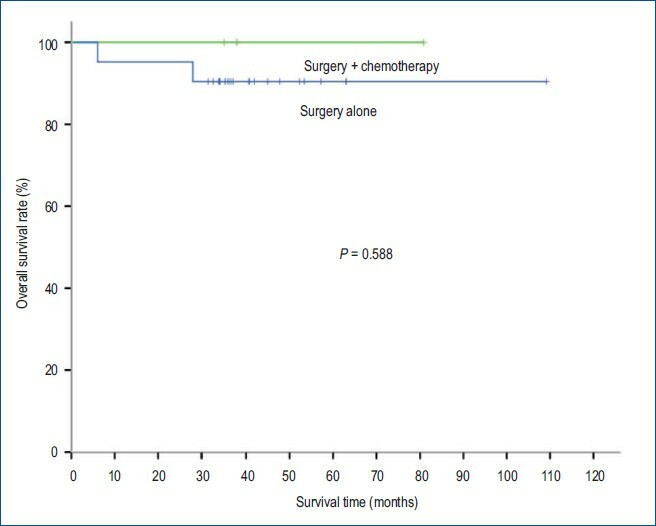 For children treated with surgery alone and surgery combined with adjuvant chemotherapy, the 3-year event-free survival rates were 23.8% and 100%, respectively (P = 0.042), and the 3-year overall survival rates were 90.5% and 100%, respectively (P = 0.588). These results suggest that adjuvant chemotherapy can help to reduce the recurrence rate and increase the survival rate for patients with stage II germ cell tumors. Testicular tumors are rare in children. They account for only 1% of all pediatric solid tumors and 3% of all testicular tumors[1,2]. The annual incidence of testicular tumors in children is estimated to be between 1.6 and 2 per 100,000 children[3–5]. Testicular germ cell tumors are the most common testicular malignancy in children. The modern standard comprehensive treatment is surgery combined with chemotherapy, yielding a 5-year overall survival (OS) rate of 75%–100% for children with testicular malignant germ cell tumors (MGCT)[7–9]. A study by the Pediatric Oncology Group/Children’s Cancer Group (POG/CCG) demonstrated that the 6-year event-free survival (EFS) and OS rates for children with stage I testicular germ cell tumors who underwent orchiectomy were 78.5% and 100%, respectively, whereas the 6-year EFS and OS rates for children with stage II testicular germ cell tumors who received orchiectomy and chemotherapy were both 100%. Data from clinical studies show convincingly that children with stage I MGCT of the testis have excellent survival rates when treated with surgery alone[7,10], whereas the expert consensus is that children with stage II to IV germ cell tumors require adjuvant chemotherapy after surgery. Indeed, for patients with stage II germ cell tumors, further intervention following surgery is needed when serum tumor markers increase or fail to normalize after an appropriate period of half-life time has elapsed. Despite having no evidence of residual disease by either imaging or pathologic examination, these patients are good candidates for adjuvant chemotherapy. Fearing toxicity, however, many parents decided that their children should forgo adjuvant chemotherapy. Few studies have evaluated the prognosis, disease recurrence, and survival rate of children with stage II testicular MGCT treated with surgery alone. To fill this gap, we studied the medical records of 24 children with stage II MGCT and retrospectively analyzed their relapse and OS rates. We reviewed the medical records of 24 children who were treated for stage II testicular MGCT at the Sun Yat-sen University Cancer Center between January 1990 and May 2013. The records included physical examination, histopathologic findings, chest radiography, abdominal/pelvic computed tomography (CT) scan, color Doppler ultrasound of the bilateral testes and epididymis, alpha-fetoprotein (AFP), beta-human chorionic gonadotropin (β-HCG), and serum lactate dehydrogenase. All patients underwent standard surgical treatment, which consisted of orchiectomy with high ligation of the spermatic cord. Disease stage was assigned according to the POG/CCG system, which is based on postoperative pathologic findings, imaging findings, and tumor markers. By this system, stage II refers to those treated with orchiectomy via transscrotal surgery; microscopic disease in the scrotum or high in the spermatic cord (<5 cm from the proximal end); and retroperitoneal lymph node involvement (<2 cm) and/or increased tumor marker levels after an appropriate period of time. For this study, children with stage II disease whose serum tumor markers increased or failed to normalize after an appropriate period of half-life time post-orchiectomy and who had no evidence of residual disease on imaging or pathologic results were enrolled. The adjuvant chemotherapy scheme was PEB, which is composed of cisplatin 20 mg/m2 intravenous drip each day on days 1–5, etoposide 100 mg/m2 intravenous drip each day on days 1–5, and bleomycin 15 mg/m2 intramuscular on day 1. Treatment was repeated at 21-day intervals for a total of 4 cycles. The primary follow-up data included physical examination, determination of tumor markers, chest radiograph, CT scan or color Doppler ultrasound of the abdomen and pelvis, and color Doppler ultrasound of the bilateral testes and epididymis. AFP and β-HCG were monitored every week until they reached normal levels, then every 3 months for the first year, every 6 months during the second year, and annually thereafter. Physical examination, chest radiograph, CT scan or color Doppler ultrasound of the abdomen and pelvis, and color Doppler ultrasound of the bilateral testes and epididymis were performed every 3 months in the first year, every 6 months in the second year, and once a year thereafter. Recurrence was defined according to any of the following criteria: (1) tumor marker levels increased post-surgery after initial normalization; (2) new lesions were observed concurrently with rising tumor marker levels; or (3) new lesions were confirmed by pathology. EFS was defined as the time from study entry to the first occurrence of progressive disease (PD), relapse, second malignancy, death, or until the last reported contact if none of these occurred. OS was defined as the time from study entry until death or until the last reported contact. SPSS 16.0 statistical software was used. Survival estimates were computed and compared using the Kaplan-Meier method and log-rank test, respectively. P values less than 0.05 were considered significant. We identified a total of 24 children with stage II disease whose serum tumor markers increased or failed to normalize after an appropriate period of half-life time post-surgery. Twenty-one patients were treated with surgery alone, and 3 patients were treated with surgery and adjuvant chemotherapy. Patient characteristics are shown in Table 1 . The median age was 24 months (range, 4 months to 17 years). A total of 20 tumors (83.3%) had yolk sac (endodermal sinus) histology, whereas the histology of the remaining 4 included seminoma, embryonal carcinoma, teratoma with malignant epithelial component, and mixed germ cell tumor (yolk sac tumor and embryonal carcinoma). AFP levels were elevated in all patients with non-seminoma histology. The median level of AFP was 3,675 ng/mL (182.3 to 42,715 ng/mL). One patient had pathologically confirmed seminoma but also had elevated serum β-HCG. For all patients, serum tumor markers failed to normalize after an appropriate period of time. No relapse or metastasis was observed in the 3 patients who received adjuvant chemotherapy. Of the 21 patients who were treated with surgery alone, 16 (76.2%) had a relapse and/or metastasis; all 16 patients showed elevated AFP levels, and 15 patients showed relapse on images (CT for 14 cases and color Doppler ultrasound for 1 case). Patient characteristics are shown in Table 2 . The median time from surgery to relapse was 4 months (range, 0.5 to 14.3 months). The relapses occurred locally in 1 patient and regionally (retroperitoneal lymph nodes) in 2 patients. Ten patients (62.5%) subsequently showed evidence of distant metastasis. Two patients had local relapse and distant metastasis. The AFP level was over 10,000 ng/mL in 11 patients. In 9 patients, AFP levels failed to normalize at 1 month after surgery. LSC, left spermatic cord; LT, left testis; RS, right scrotal; PLN, para-aortic lymph node; L, lung; PILN, pairs of inguinal lymph nodes; DALN, double axillary lymph nodes; AC, abdominal cavity; RLN, retroperitoneal lymph node; APC, abdomen and pelvic cavity; LILN, left inguinal lymph node; MLN, mediastinal lymph node; P, pleura; HLN, hilar lymph node; C, chemotherapy; S, surgery; A, alive; D, dead. NA, not available. D*: The patient’s parents refused further treatment after one cycle of chemotherapy and then the child died due to the tumor 3 months later. All patients with relapse and metastasis were given PEB chemotherapy. The 16 children who experienced relapse and metastasis underwent the following treatments (Table 2 ): salvage chemotherapy (11 patients), second-look surgery and salvage chemotherapy (2 patients), salvage chemotherapy followed by second-look surgery (2 patients), and 1 cycle of salvage chemotherapy followed by second-look surgery and further salvage chemotherapy (1 patient). The parents of 1 patient refused further treatment after 1 cycle of chemotherapy; the remaining 15 patients had normalized AFP values after salvage treatment and achieved complete response. The patients received a median of 6 cycles (range, 1 to 10 cycles) of salvage chemotherapy. There were a total of 2 deaths. The patient whose treatment was stopped died due to the tumor 3 months later. The other patient achieved complete response after salvage treatment but developed lung and pelvic metastases 7 months later and died of the tumor after stopping treatment. The remaining 14 patients were alive at the time of last follow-up. Three patients who received surgery combined with adjuvant chemotherapy treatment onset were given 12 cycles of PEB chemotherapy. The total number of chemotherapy cycles for all 16 patients who relapsed was 78. The main adverse effect was bone marrow suppression. The rates of grade IV bone marrow suppression for initial adjuvant chemotherapy and chemotherapy after relapse were 0% and 7.7%, respectively, and the rates of grades I–II gastrointestinal reaction were 2.6% and 61.5%, respectively. Renal toxicity, ototoxicity, and lung toxicity were not observed. No patients died of adverse effects. No second malignancies occurred. The median follow-up period was 37.9 months (range, 6 to 109 months). The 3-year EFS and OS rates of all 24 patients were 33.3% and 91.7%, respectively. The 3-year EFS rates of patients who were treated with surgery alone and surgery combined with adjuvant chemotherapy were 23.8% and 100%, respectively (P = 0.042; Figure 1 ). The 3-year OS rates of patients who were treated with surgery alone and surgery combined with adjuvant chemotherapy were 90.5% and 100%, respectively (P = 0.588; Figure 2 ). EFS rate was higher for patients with AFP levels ⩽ 400 ng/mL when compared with patients with AFP levels >400 ng/mL (100% vs. 20.0%, P = 0.032). By contrast, EFS rate was not significantly different for patients with AFP levels <10,000 ng/mL as compared with those with AFP levels ⩾ 10,000 ng/mL (41.7% vs. 18.2%, P = 0.061). In the 21 patients who were treated initially with surgery and observation (watch-and-wait approach), EFS rate was greater for patients in whom the AFP level normalized 1 month after orchiectomy as compared with patients whose AFP level failed to normalize (75.0% vs. 11.8%, P = 0.044). Event-free survival of children with stage II testicular malignant germ cell tumors treated with surgery alone and surgery combined with adjuvant chemotherapy. Overall survival of children with stage II testicular malignant germ cell tumors treated with surgery alone and surgery combined with adjuvant chemotherapy. Patients with stage II germ cell tumors of the testes have high survival rates when treated with surgery and adjuvant chemotherapy; the OS rates in several studies have been over 95%[4,7,9,11–13]. In a POG/CCG study, 17 pediatric patients with stage II testicular MGCT received 4 cycles of PEB chemotherapy post-surgery, and both the 6-year EFS and OS rates were 100%. In an earlier United Kingdom Children’s Cancer Study Group (UKCCSG) study, children with stage II testicular MGCT had a 5-year OS rate of 86% when treated with surgery and PEB chemotherapy. Another UKCCSG study demonstrated that the 5-year EFS and OS rates of children with stage II testicular MGCT were both 100%, when children received 4 to 6 cycles of adjuvant JEB (carboplatin, etoposide, and bleomycin) chemotherapy’91. In a German study, 22 children with stage II testicular MGCT were treated with CVB (cisplatin, vinblastine, and bleomycin) chemotherapy, and the 5-year OS rate was 95%’111. A previous study in our center showed that the 3-year OS rate was 100% after 4 to 6 cycles of PEB chemotherapy in children with stage II testicular MGCT’141. Nevertheless, most children with MGCT are quite young at disease onset, with the first peak incidence occurring before the age of 2 years. Adjuvant chemotherapy is routinely recommended for these young patients with stage II disease whose serum tumor markers fail to normalize after an appropriate period of half-life time and who have no evidence of residual disease. However, concerns regarding toxicity often prompt parents to decline chemotherapy for these patients. Indeed, in the present study, the parents of 21 patients refused adjuvant chemotherapy. The relapse rate was high at 76.2%. Although there was no imaging or pathologic evidence of residual disease, failed post-surgical normalization of the serum tumor markers AFP and HCG after an appropriate period of time indicated the presence of residual tumor cells that secrete these marker proteins[10,15]. The 3 patients in the present study who received orchiectomy and adjuvant chemotherapy had a 3-year EFS rate of 100%. Thus, children with stage II disease with tumor markers that failed to normalize need to receive adjuvant chemotherapy to eliminate residual tumor cells, and thereby reduce recurrence and improve survival. At the time this protocol was designed, tumor marker decline during chemotherapy had demonstrated in a retrospective analysis a strong relationship with treatment outcome. AFP has a half-life of 7 days, and β-HCG has a half-life of 3 days. Thus, for an AFP level of 400 ng/mL after surgery, the level should fall below 25 ng/mL at 28 days after surgery. We suggest that post-surgery, AFP should be monitored weekly until it reaches normal levels, which refers to a measurement less than 25 ng/mL. If serum tumor markers fail to normalize after an appropriate period of time, the patient should be treated with chemotherapy. The level of AFP at diagnosis is closely related to prognosis. Two studies revealed that patients with an AFP level ⩾ 10,000 ng/mL had a poor prognosis[17,18]. In the present study, 12 patients had AFP levels >10,000 ng/mL. We compared the 3-year EFS rates between patients with AFP levels <10,000 ng/mL and AFP levels ⩾ 10,000 ng/mL, and the difference was not statistically significant (41.7% vs. 18.2%, P = 0.061). This may be due to the limited number of cases in this study. In contrast, the 3-year EFS rate for the 21 children who underwent surgery alone was higher when the time to AFP normalization was <1 month compared with ⩾ 1 month (75.0% vs. 11.8%, P = 0.044). The rate of AFP decline to normalization was therefore associated with prognosis. If the AFP level does not decline to normal 1 month after surgery, the patient should receive adjuvant chemotherapy. Nevertheless, AFP levels in most patients do not decline to normal, probably due to residual tumor cells, though potentially due to liver damage or false positives caused by treatment medications’191. Here, the relapse rate was very high when AFP was high after the appropriate time for decline or did not fall to a normal level more than 1 month after surgery. Barring possible false positives, the results suggest that patients who exhibit these characteristics should be treated with adjuvant chemotherapy. In the present study, PEB was the regimen for both adjuvant chemotherapy and chemotherapy after relapse. Children who were treated with orchiectomy followed by 4 cycles of adjuvant chemotherapy had an excellent outcome. The 3-year OS rate of children with relapse and metastasis remained high (90%) after salvage treatment. Patients in this group received more cycles of chemotherapy. In this study, the median number of cycles after relapse was 6, and the maximum number was 10. The main adverse reaction observed in this study was bone marrow suppression. The rates of grade IV bone marrow suppression for initial adjuvant chemotherapy and chemotherapy after relapse were 0% and 7.7%, respectively, and the rates of grades I–II gastrointestinal reaction were 2.6% and 61.5%, respectively. Toxicity became more severe as the number of chemotherapy cycles after relapse increased. Renal toxicity, ototoxicity, and lung toxicity were not observed. A study from UKCCSG showed that the rates of renal toxicity and ototoxicity were 45% and 10%, respectively, and 1 patient died of secondary leukaemia. Therefore, there is a relatively high level of toxicity after recurrence, even with a high survival rate. Most cases of recurrence are detected using tumor markers or abdominal CT scan[20, 21]. In this study, recurrence was detected by using CT scan in 87.5% (14 of 16) patients. Furthermore, a report showed that 80% of events occurred in the first year post-surgery, and more than 90% of events occurred during the first 2 years. In a large study of children with stage I testicular MGCT, 80% of recurrences occurred in the first year after surgery, 12% occurred in the second year, 6% occurred in the third year, and approximately 1 % occurred in the fourth and fifth years, with occasional occurrences in subsequent years[23, 24]. In this study, the median time from surgery to relapse was 4 months (range, 0.5 to 14.3 months). Consequently, close follow-up is essential for patients in the first 5 years. Tumor markers should be monitored, and abdominal CT scan should be obtained periodically. 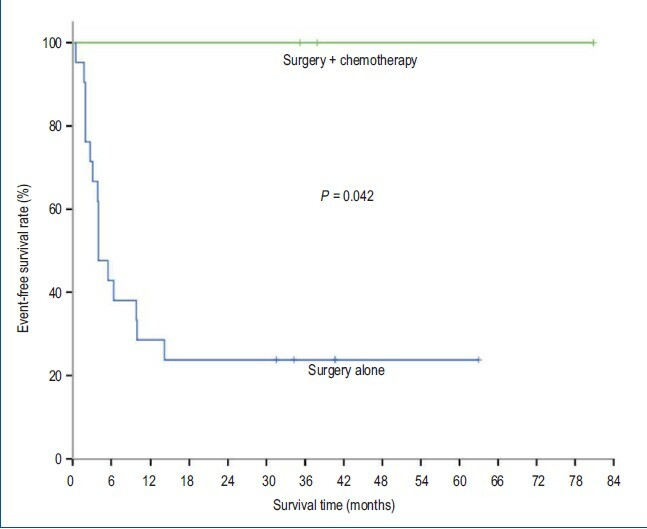 In conclusion, to reduce recurrence and improve survival of children with stage II MGCT, adjuvant chemotherapy should be given to those whose serum tumor markers increase or fail to normalize after an appropriate period of half-life time following surgery even if there is no imaging or pathologic evidence of residual disease. Tumor markers should be monitored periodically post-surgery. If serum tumor markers fail to normalize after an appropriate period of half-life time, the patient should be treated with chemotherapy as soon as possible.